After a period of quiet, the tropics have again come alive. Multiple tropical cyclones are roaring across the Pacific, but the most freaky looking is easily Typhoon Soulik, currently a weak Category 4-equivalent storm that’s on a path toward South Korea. I mean, just look at that thing. The eye on Soulik is an estimated 57 miles wide. Using that to calculate a rough area reveals that the eye is about five time larger than the area of Los Angeles. In comparison, most cyclones have an eye that’s about 16 miles wide, according to an exhaustive study published earlier this year. Rather than your typical buzzsaw appearance most tropical cyclones take on, Soulik is also remarkably smooth and round on the edges (though it’s starting to fray a bit as it hits land and cooler water). That combination of big eye and shocking concentricity make Typhoon Soulik what’s called an annular typhoon. Meteorologist Dennis Mersereau, former purveyor of The Vane and current Forbes contributor, compared Soulik and its annular brethren to bagel, which, yes. But despite their familiar appearance, annular typhoons are pretty rare. According to an analysis of typhoons in the western Pacific, only 12 annular typhoons formed from 1990-2009, representing four percent of all typhoons over that period. It’s not entirely clear exactly what causes them to form, but it does appear that certain conditions increase the odds. Scientists have found that a relatively cold upper atmosphere and weak upper level westerly winds are two key ingredients, as well as ocean temperatures between 78.8-84.4 degrees Fahrenheit. Despite their rarity, this is the second year in a row for an annular typhoon to appear in the western Pacific. Typhoon Noru formed in July last year and followed a meandering track to the east of Japan before eventually making landfall on Honshu, Japan’s main island. Annular tropical cyclones also tend to be intense, and Soulik is no exception. The storm is tracking near the Ryukyu Islands of southern Japan with winds gusting near 133 mph, which is nothing to sneeze at. Soulik is forecast to make landfall in South Korea on Thursday and could approach Seoul at hurricane or near-hurricane strength before weakening rapidly. The typhoon parade doesn’t stop after Soulik, either. 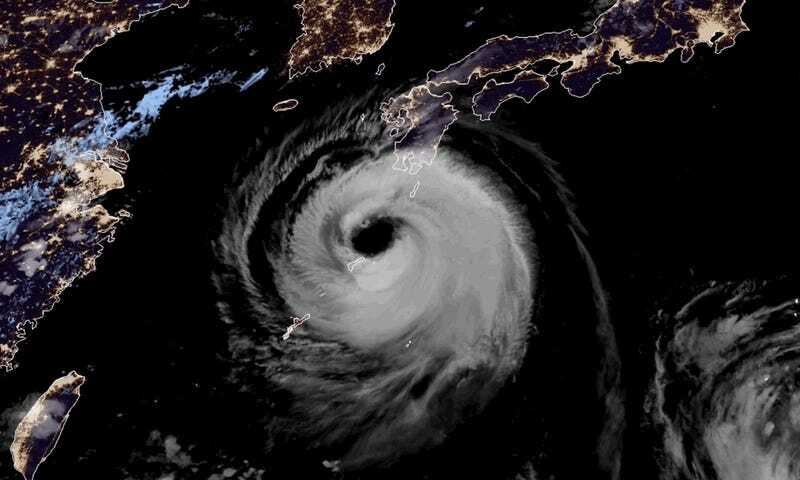 Typhoon Cimaron is hot on its heels and is expected to make landfall on Honshu on Thursday as well, which is extremely unwelcome news for a country that has been racked by climate disasters this year. What’s This Subtropical Storm Thing Headed Toward the Gulf Coast? How Do Meteorologists Rank Hurricanes, and Will I Die?